Hayward Nordic Kids is joining forces with the American Birkebeiner Ski Foundation! Two great groups becoming one, means that Hayward Nordic Kids has all of the support of the ABSF and will continue to provide an outstanding ski opportunity for kids in Northwest Wisconsin. Hayward Nordic Kids is open to children age 3 years old – 5th grade. The cost for the 2019 Winter Season (8 lessons) is only $25. 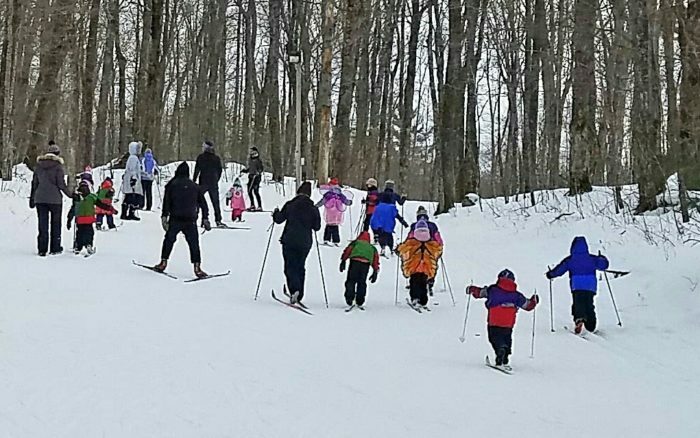 Teach your child to love skiing and the great outdoors with Hayward Nordic Kids! To promote the sport of cross country skiing by providing a fun and organized teaching program for all area youth. We encourage children to develop skills in cross country skiing in a non-competitive atmosphere. Parents are asked to be present during lessons. The younger groups do not ski for the full two hour lesson, please confirm with each head coach about length of lesson. On colder days, lessons may be shortened. Please do not walk on the trails, even if you are helping with your child’s group. Registration for the 2018 – 2019 season is November 10 – December 9, 2018, or until 150 kids are registered. Registration and equipment rental must be completed online. If you need computer access, you may register in person at the HASTA Ski Swap on Saturday, November 10 from 9-11 a.m. at the Hayward Wesleyan Church. Please email haywardnordickids@gmail.com with any questions. 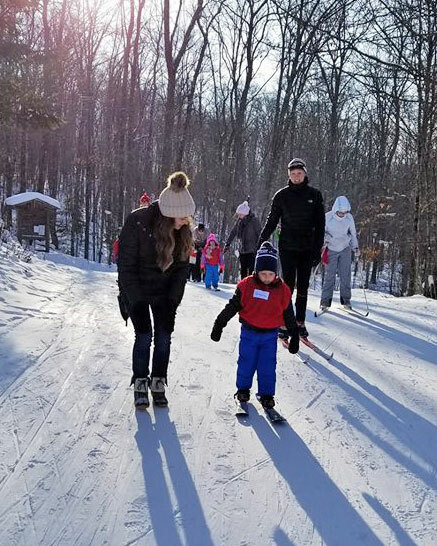 We love to share photos of the fun the kids have at Hayward Nordic Kids. Photos will be used in our gallery and on our Facebook page; permission for this is included in the online registration. Skis, boots, and poles for both skate and classic techniques may be rented for just $45 for the season. Kids must be registered and taking lessons in order to rent equipment. Equipment rental handout is Tuesday, December 11, from 3:30-5 p.m. Distribution takes place behind Apple Awards on Hwy 63 North. Volunteers will be on hand to help fit your child for skis, boots and poles. Children in Hayward Nordic Kids are grouped by age and skiing technique. We teach the classic technique through 2nd grade and then allow children to choose to either learn the skate technique from 3rd-5th grade or stay with the classic technique. Groups are designated by age or grade. The Bunnies are 3-4 year-olds; Jack Rabbits are 4-5 year-olds; Arctic Foxes are in Kindergarten; Wildcats are in 1st grade; Timberwolves are in 2nd grade; Snowflakes are in 3rd grade, using skate technique; Blizzards are in 4th grade, using skate technique; Avalanches are in 5th grade, using skate technique; Grizzlies are in 3rd-5th grades using classic technique. Hayward Nordic Kids coaches are all volunteers, and we appreciate the time and effort they contribute each week to teach your children the lifelong sport of skiing! We always welcome volunteers and coaches at any level to help make each lesson great. Whether it’s getting out on the beautiful Birkie Trail system to coach or assisting our hard-working coaches, we’d love to have your help. Each season is fun and successful because of the great help we receive to make Hayward Nordic Kids a great experience for all skiers. Please consider volunteering to help a child enjoy winter and learn a lifelong sport! We welcome new ideas and value enthusiasm from parents, coaches and volunteers, new and old. To volunteer with Hayward Nordic Kids, please click HERE. We’re looking forward to a great season! Email haywardnordickids@gmail.com if you have any questions!